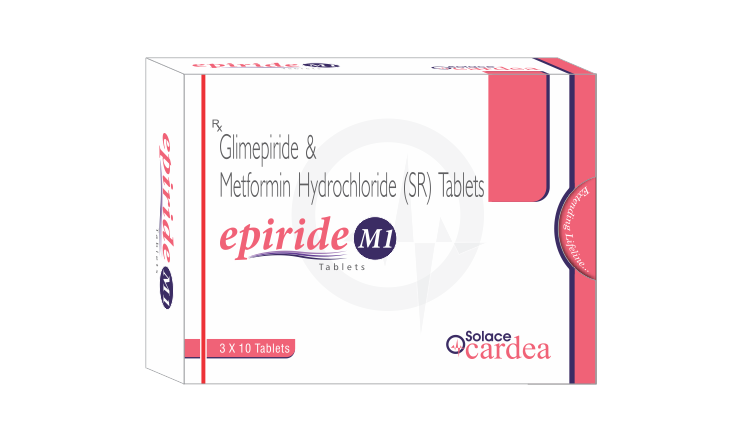 Epiride M1 Tablet contains glimepiride and metformin in sustainrelease form. Glimepiride is a sulfonylurea anti-diabetic drug. It belongs to third generation anti-diabetic drug. It is also an oral antidiabetic drug which belongs to biguanide class which is the first line treatment for type 2 diabetes mellitus. It causes suppression of glucose production by liver. It causes the stimulation of insulin release from pancreatic β-cells which causes the inhibition of gluconeogenesis in hepatic cells. This also increases the insulin sensitivity. It decreases gluconeogenesis in liver and also decreases the intestinal absorption of glucose. It also improves the sensitivity of insulin. In fasting condition of the patients, the drug bioavailability is about 50% to 60%. Food decreases the absorption of drug. The volume of distribution is 654±358 L. It rarely bonds to plasma protein. It does not follow hepatic metabolism. The drug is well distributed in the body and volume of distribution is 8.8 L. the drug is metabolized by oxidative biotransformation. In the biotransformation of glimepiride to M1, cytochrome P450 2C9 is involved. The major metabolites are the cyclohexyl hydroxy methyl derivative (M1) and the carboxyl derivative (M2). About 60% of the drug is excreted through urine in seven days.